The Euro Weekly News, owned by Michel and Steven Euesden, proudly supported a Special Summer party in aid of Children with Cancer UK, held at Villa Tiberio, which was billed as one of the events of the season on the Costa, and it certainly did not disappoint. The cream of Marbella society, together with some pretty spectacular showbiz names turned up prepared to go the extra mile to raise money for the children, even María Ángeles Muñoz Oriol, the Mayor of Marbella came along to show her support. Frankie Valentine kicked off the event, made everyone welcome and set the tone for the evening, which was continued by ‘Respect the Divas’, a trio of gorgeous young ladies who really got the party started, and Mel Williams, a popular local singer was welcomed with open arms by everyone who danced along with him, including the staff of Euro Weekly News. 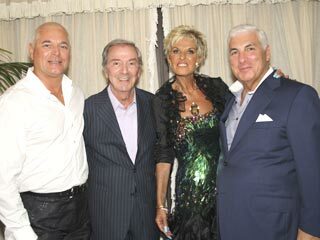 Michel and Steven Euesden with Des O’Connor (second left) who was a big hit with the audience, and Mitch Winehouse (right) who sang a duet with Hannah Paul and graciously donated a selection of his daughter Amy’s CD collection. Des O’Connor was by far the most popular with the audience and he had everyone in stitches by duetting with himself, occasionally forgetting the words to his old hit “Marbella”. Mitch Winehouse sang a few classic hits and was joined by Hannah Paul and even though they had not rehearsed together they made a spectacular duo. Some well known faces from British television and the London stage helped alongside the local talent: having just finished a stint in Mamma Mia! Neil Roberts’ party games had everyone in hysterics, and he also helped to host the auction with Maurice Boland. Also from Mamma Mia!, Julie Atherton, and Charlotte Wakefield (Maria in the Sound of Music) both took time out from their London stage day jobs to sing for the audience. The auction had some incredible lots up for grabs including dinner with Peter Stringfellow and signed football memorabilia as well as boxes for some of London’s top theatre shows. A selection of Amy Winehouse’s CDs, donated by her father Mitch, raised 3,100€. The most prolific donors who alone raised several thousands of euros, were Bruce Walker and Martin Briane. The auction and the raffle, together with ticket sales, raised over €30,000 for the children’s charity throughout the evening. Caroline Randerson, organiser for the UK charity, was delighted with the evening’s events: “This year we sold double the usual number of tickets. We have never managed to sell out before. This year was the seventh edition of the event and it was a brilliant night. A special thank you has to go to everyone who helped to make it such a superb evening from Sandro, Dee and the staff at Villa Tiberio, right up to the people who made the effort to travel from the UK especially to perform for the night. And, of course the Euro Weekly News has been incredible. We couldn’t have done it without their support.